Welcome to the articles section of the website! 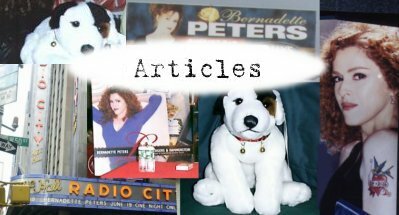 Here we will place articles written by various members who attended Bernadette Peters events. Who is George and where is he going? Well, you're justing going to have to read his story! Singing her new Rodgers and Hammerstein songbook Bernadette truly made her Radio City Debut a "Grand Night For Singing". Bernadette meets with fans and signs copies of her newest CD at the Virgin Megastore in Times Square.